Combine the sliced red onion, the sugar, ½ teaspoon of sea salt, and a pinch of black pepper in a sauté pan. Stir well. Put the pan on medium low heat. Cook the onions for about 15 minutes stirring occasionally. The onions should become dark brown (but not burned) in color. Set the onions aside. Rub the bread dough with olive oil and place it in a large bowl. Cover the bowl with plastic wrap. Let the dough sit out at room temperature for three hours. 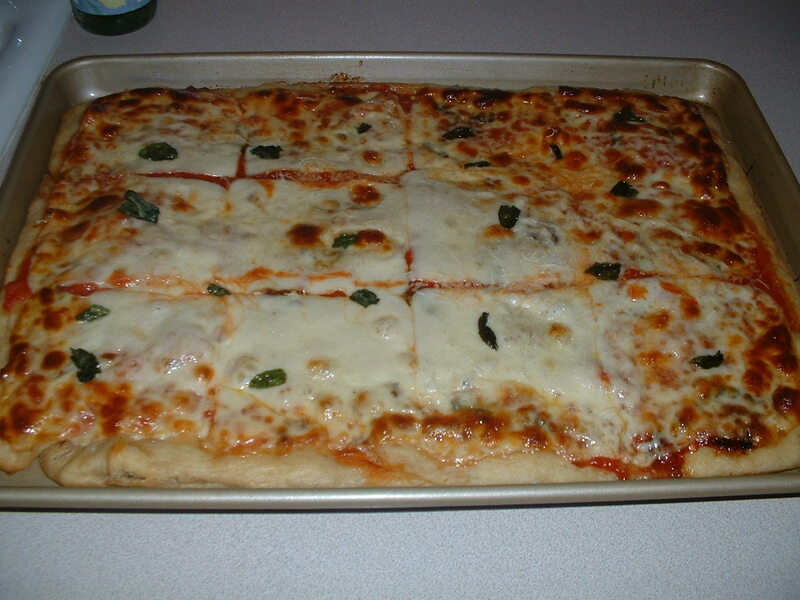 Brush a large one inch deep rectangular baking pan with olive oil (including the sides). Place the dough in the pan. Using your hands, spread the dough out until it fills the entire pan. Be patient. This process can take awhile. 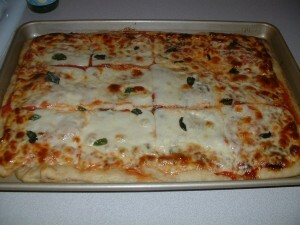 Once the dough has been spread out, bake it in the preheated oven for 10 minutes. Remove the flat bread and let it cool for ten minutes. Brush the top of the flat bread with olive oil. Arrange the carmelized onions and the minced garlic equally around the top. Next, place the crushed tomatoes evenly over the top of the onions and the garlic. Sprinkle the tomatoes with a teaspoon of sea salt and the crushed red pepper flakes. Now, uniformly place the basil over the tomatoes. Finally, add the shredded mozzarella cheese equally over the tomatoes. Bake the flatbread in a preheated oven set at 450 degrees for 15 minutes until the cheese is bubbly and slightly browned around the edges of the flatbread. Let the flatbread cool for 10 minutes before cutting it into squares.